WHEREVER you walk in Scotland’s mountains, there are poignant reminders that you are walking through a sad and painful history. The remains of solitary houses stand in remote glens where every day must have been a struggle way beyond the comprehension of even the poorest in today’s society. Statues and monuments to the overlords of cruelty and misery look down on their handiwork and the remnants of structures toiled over for scraps of food. The A832 running down to Dundonnell was known as Destitution Road, having been constructed with the stones from the demolished cottages of those forced out by the landowners. The irony was that these same evicted tenants then built that road for a pathetic hand-out just to survive for another miserable day. 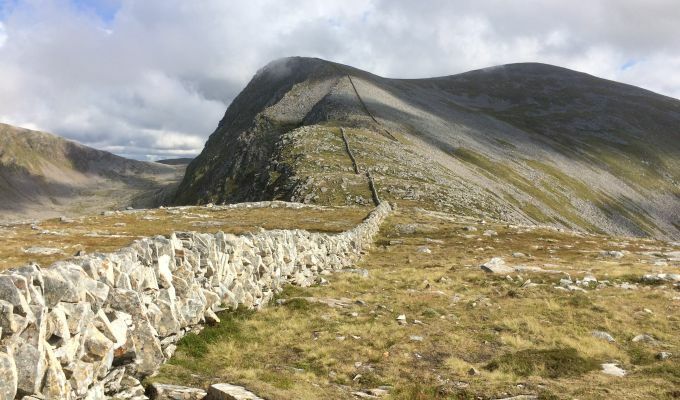 A few miles to the east are the mountains known collectively as the Beinn Deargs, a group of Munros clustered round the eponymous peak which is also the highest point. 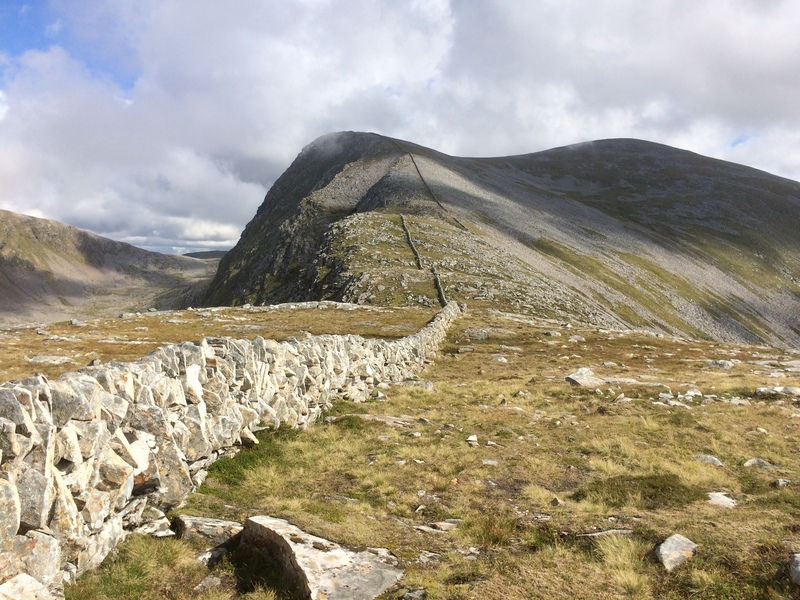 Running for several miles along the east-west ridge on Beinn Dearg is another sad reminder of our past, a huge drystane dyke, in places up to six feet high. It was built in the 1840s during the potato famine by starving crofters in return for food, just another monument to the harsh Highland living conditions of the time. The walk into the heart of these of these mountains starts at Inverlael off the A835 at the bottom end of Loch Broom. A good track leads on to a fine path up Gleann na Sguaib through stunning scenery of waterfalls and towering cliffs. There’s a split in the path which leads to Eididh nan Clach Geala - translation: web of the white stones - if you are inclined to do these hills this way round, taking in Meall nan Ceapraichean next and then Cona’ Mheall before tackling Beinn Dearg. Stay on the main branch of the path though and eventually a climb up beside a small loch brings you to the wall and the central point of three mountains. The view down into the wonderful Coire Ghranda is always one to savour, and it spotlights another fine route, a horseshoe circuit from Loch Droma which leads up Cona’ Mheall’s south ridge before sweeping round and down the other side of Beinn Dearg. From the wall at the col it’s just a matter of deciding in which order you are going to climb the hills. 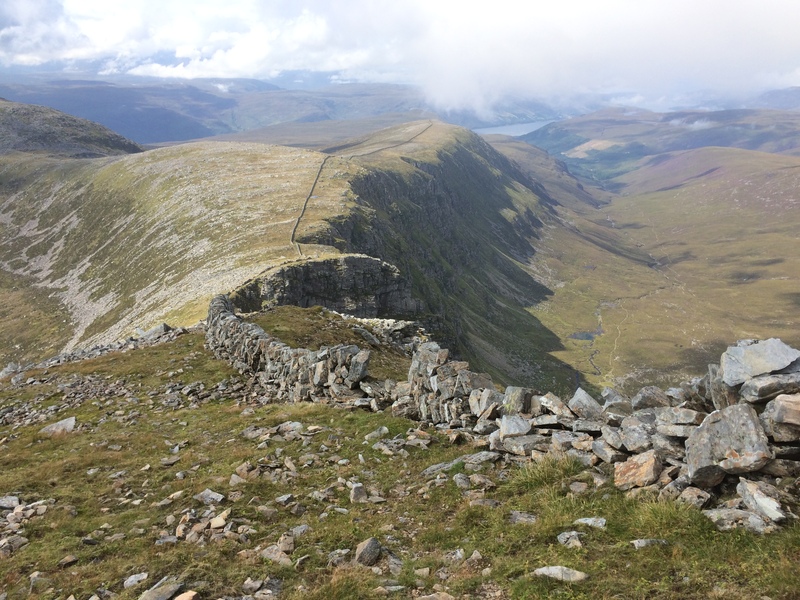 Cona’ Mheall is the one through the back, a short descent and then an easy walk up to the summit boulderfield and the cairn which sits at the end of the flat-topped ridge. Meall nan Ceapraichean is also easy, a short push up a ramp of short grass and stones. The ascent of Beinn Dearg follows the dyke south up the slopes and when it takes a sharp right turn, you go through the gap for the final push to the huge summit cairn. Many years ago, I finished the circuit of four on this hill and descended by the wall all the way down the ridge. It is still in remarkable shape, considering its age and the extreme conditions it has been battered with over the years. When the wall finally runs out, it’s a steep, loose descent to the floor of the glen and a river crossing that can be interesting in spate. The day may now be over and the wall left behind but it’s doubtful if you will forget its sad legacy.